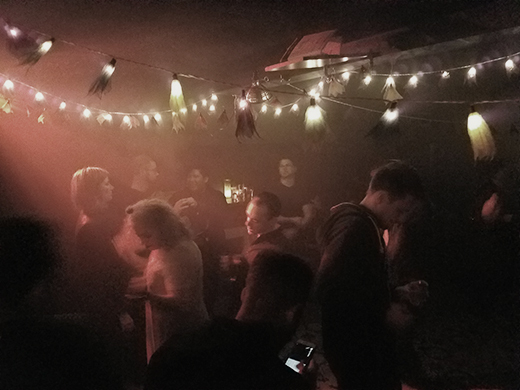 A new dance night, Svmmon, self-described as a “decadent, dark experience” opened at the downstairs space of the Talon Bar in Brooklyn’s Bushwick section on Friday May 12. And, no, it is not misspelled. 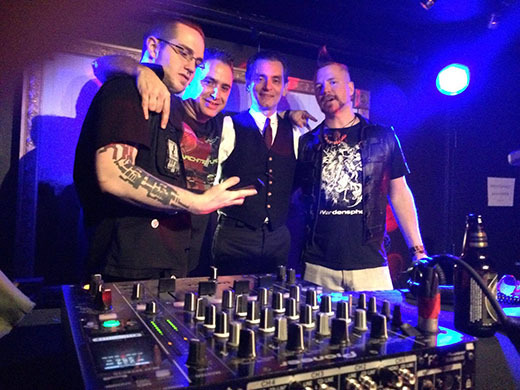 Host deejays Joe Hart, Andi Harriman and Hi-Fi Hillary filled the air with new and classic goth, darkwave deathrock dance music. Heard during the night were such prime movers as “Poison Door” by Sisters of Mercy, “Stranger” by Clan of Xymox and “The Calling” by Death in June. A rather repetitive video loop showed silently on a brick wall in the passageway between the bar and dance floor. The bar was well stocked and the friendly barista a most adept and accommodating mixologist. There was seating along the walls for those who needed a rest from hoofing it. An early highlight and photo-op occurred when gorgeous ecdysiast Casandra Rosebeetle took to the dance floor in black, fetish-inspired attire and – to musical accompaniment – removed her garments right down to and past an attractive lingerie outfit and beyond. Facebook counted around 62 attendees. There appeared to me at least that many. It suffices to say that the place was packed to capacity with enthusiastic and black-clad dancers and imbibers. For an opening night event, Svmmon appears to have set some king of attendance record for a small, downstairs venue, portending a very serious revival of the Goth scene in the greater NYC area. There aren’t many ways to better spend a musical evening than taking in the performances of 3 superbly accomplished bands as they pay tribute to 3 of the best bands of the 90s. 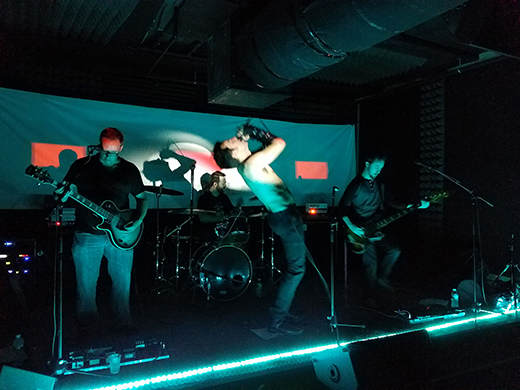 So, for the third time in as many months we headed to the venue where SIN, the region’s top Nine Inch nails tribute band opened the night . 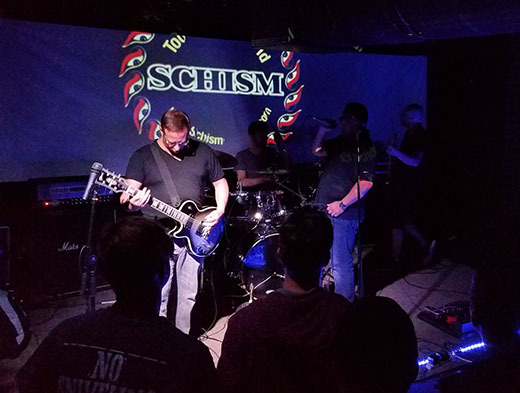 Lead guitarist Keith Williams, mastermind behind Tool tribute headliners, opened SIN’s set with a virtuosos rendition of the short , menacing riff known as “Pinion” from the “Broken” album. 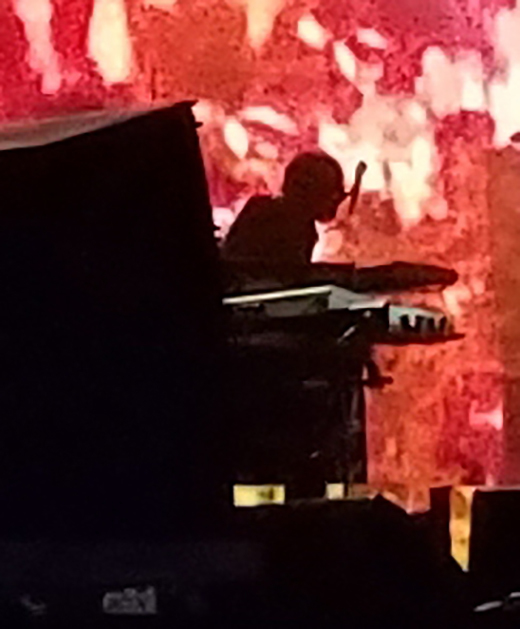 Lead vocalist Byron Huares then led the group on an 8-song set, starting with “Terrible Lie” and then “Head Like A Hole,” the monumental piece that lays at the roots of the whole electronic-industrial craze of the 90s. 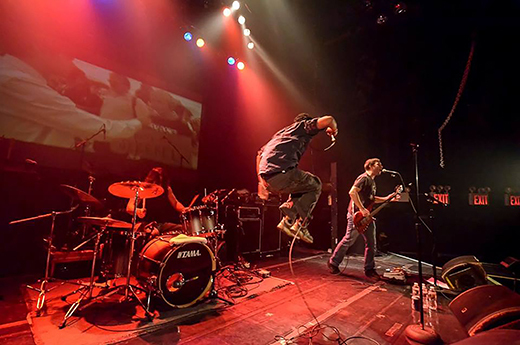 Speaking of physicality, nothing could top Battle of Los Angeles’s lead vocalist, Christian Alcantara who performed the stunts of leaping and hopping while also capturing the cadence and timbre of Rage Against the Machine’s Zack de la Rocha’s defiant rap. The audience, as on each prior performance of Schism which I have witnessed, was stunned and awed by the sheer mastery and delicious re-creation of Tool’s revered repertoire of hits. Energized, yet transfixed by the music the crowd rocked rhythmically in place, many mouthing the lyrics that were long-ago committed to memory. 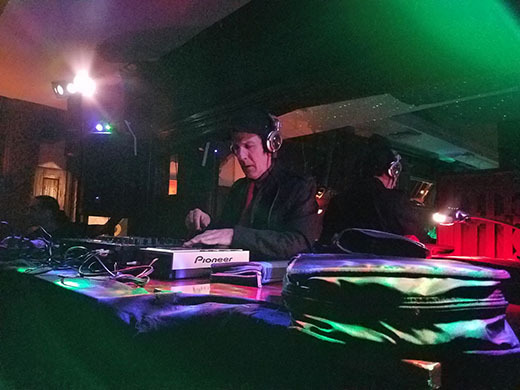 On the Saturday of the Memorial Day weekend, DJ Fr Jeff Ward held yet another occurrence of the long-standing, revered dance night featuring “new wave/ dark dance/ goth/ synth and industrial” as he likes to describe it. In addition to his usual hospitality-related duties, Chris Savo was observed installing sound insulation to contain the music within the confines of Windfall’s fancy bar and dance floor. As usual, the friendly and capable bartenders Gerard and Julia kept imbibers happy, and a sizable crowd danced the night away in defiance of tradition of leaving town on the Memorial Day weekend. And as usual, dancers were motivated to enjoy the dance floor early on with such irresistible masterpieces as “Love Come Quickly” by Pet Shop Boys, “Where Greed Talks” by Wolfsheim and “The Silence” by The Rope; and later on by “Military Fashion” by And One, “Kick in the Eye” by Bauhaus and “An Eye for the Main Chance” by Rosetta Stone. BODYLAB, standard bearer of Old-School EBM/Industrial returned to LPR where it got it’s start. A growing following of NYC Industrialists attended. The night featured DJs EISDRIVER (Qxt’s, Assimilate) and STRYKK9 from Philly (DeMolition, Spellbound) laying down the heavy EBM beats that kept the dance floor moving. 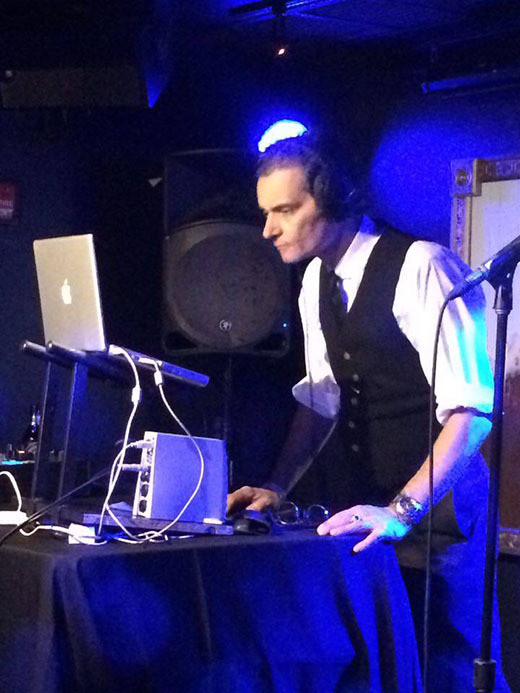 This night was a special tribute to the Industrial act SPAHN RANCH and featured an all SPAHN RANCH guest dj set by the band’s vocalist Athan Maroulis. 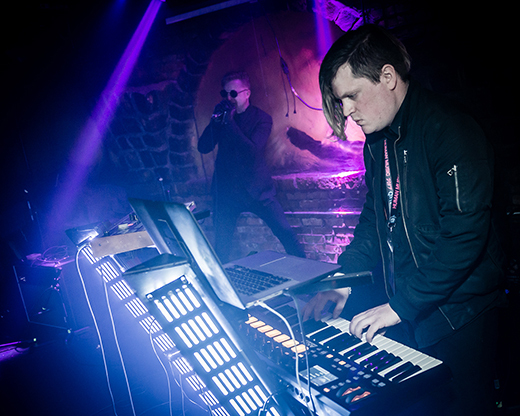 QXT’s in Newark hosted an extraordinary 2-day festival focused on the revived popularity of what is termed “synthwave,” the retro futuristic style of techno-wave that adapts newer technology to 80s darkwave synthesizer-based music. This may in fact have been an unprecedented gathering of no less than twenty bands representative of the genre plus 8 deejays steeped in the style, supported by sound, lighting and video specialists with the same aesthetic sensibilities. Tickets were priced at from $40 – $50 single-day/ $70 – $80 for both days depending on how far in advance; and $60 single-day/$100 at the door. A listing of bands the first night included Magic Sword, mysterious group whose songs are featuring in video games; Betamaxx, famous for the “Kung Fury” movie sound track; Dead Astronauts in their only USA performance, Trey Frey from Philadelphia; The Rain Within from Charlottesville, VA; Boaconstrictor; and Protector 101 out of Ventura CA. 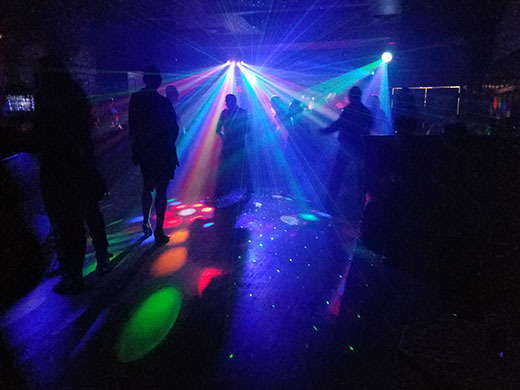 The second, full, day-into-night event started off with Dance with the Dead in their first east Coast appearance; Gost; Bit Shifter from NYC; Night Club (L.A.); Teeel from Trenton NJ; Street Fever (L.A.); Defiant Systems; Arcade High (Pittsburgh); STRNGR; Skeleton Hands (Cincinnati OH), AEON Rings (Brooklyn); Hunterquinn (Cincinnati); AndaruGO (Cincinnati) and The Encounter (NY). 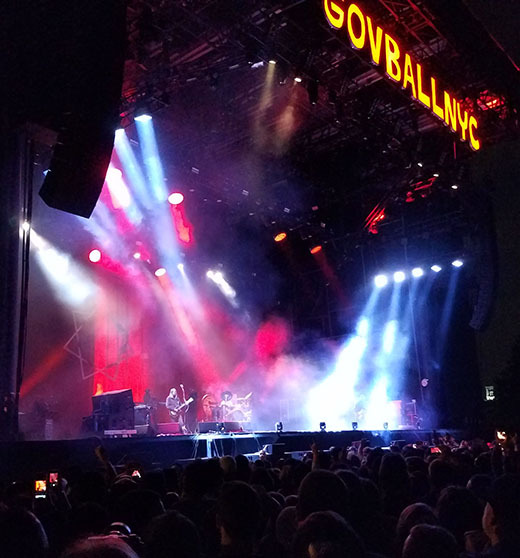 Governor’s Ball, held over 3 consecutive days and night in New York’s Randall’s Island Park was jus too large a commitment in time and money for New Dark Age to fully attend, but the lure of Tool as headline band on closing night, Sunday, was irresistible. 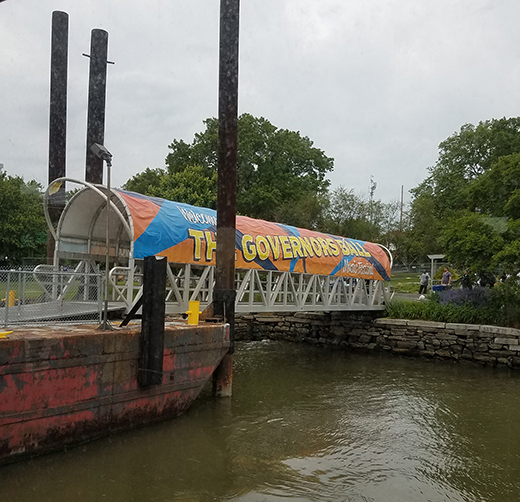 So our crew set out late Sunday afternoon, enduring unbearable traffic jams to reach the ferry slip where we boarded one craft in a steadily running shuttle service that ran from Manhattan’s East River shore to the park on Randall’s Island. Disembarking there, then traveling on foot, we hit each of the four active stages, mingled with countless throngs of young – very young – attendees, and grabbed beers and snacks at various stands set up for the occasion. Cage the Elephant from Tennessee held a vast crowd enthralled amidst whom was a smattering of skilled, self-entertaining hula-hoopers. Across the island, Phantogram, natives of Saratoga Springs, NY captivated the audience with a fine repertoire of hits and with the dazzling statuesque beauty of vocalist Sarah Barthel. 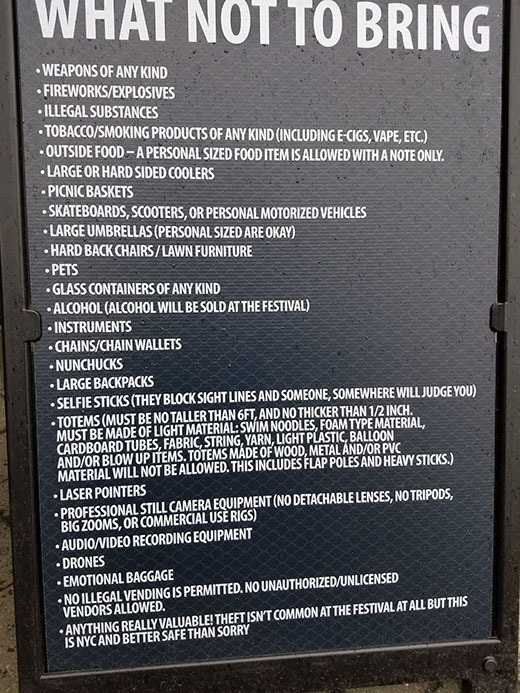 The crowd was moderately aggressive, especially close to the stage as we were, with many near-altercations that converted instantly into joyful and convivial mosh pits. Having started the show a couple of minutes late, it ended somewhat past the scheduled conclusion. The final piece, “Stinkfist” was still audible in the distance as we hurriedly crossed the vast field to catch a late ferry back to the City. The Booth and Last Rites Galleries on West 38th St in Manhattan are ever the places to visit for the latest in art with a gothic/punk/industrial flavor. Founded by renowned tattoo artist, Paul Booth in 2007 as an adjunct to his legendary tattoo parlor, these galleries operate in tandem to exhibit surrealist art with a grotesque and morbid leaning. June 3 saw the opening reception for 2 simultaneous exhibitions. The one on the first floor was called “Solace.” On display there were, among other works, large-scale (up to 9’ X 10’), high-priced (up to $40,000) oil paintings by Adam Miller in the style of old masters depicting allegorical histories, anachronistic mythological characters in modern situations and bizarre images, all done with incredibly masterful technique. His magnificent “Dream of Paradise Remembered by Moonlight” served as the cover image on the flyer for the event. Jean-Paul Mallozzi’s mixed graphite, ink, oil and acrylics also had a playful, vandalized look, featuring portraits literally defaced i.e., rendered anonymous by obliterating identifying features with gobs of medium. 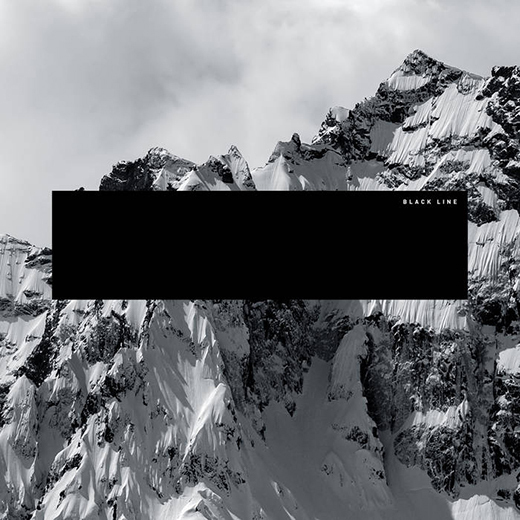 Black Line is an evolving, LA-based collective fronted by Nitzer Ebb vocalist Douglas McCarthy and founder, electronic music producer, Cyrusrex. The long list of collaborators is a who’s who of the electro-industrial scene, and includes such famous names as Paul Barker (Ministry/Puscifer) and Mark Walk (Skinny Puppy/OhGr) plus many more, equally famous. “Treason, Sedition and Subversive Activities” consists of 14 tracks with a decidedly high-tech sound. McCarthy’s voice is familiar to fans of Nitzer Ebb. Whether hissing, growling or full-throated, it is generally up front, rendering the elaborately complex synthetic music personal and emotionally accessible. At once angry and desperate, his singing brings a welcome, melodious element to the busy, manufactured music. The instrumental intros to each of these songs afford the artists opportunity to create a variety of auras, some ghostly, others pregnant with a sense of impending significance. The manifold layers of sound include both familiar and unfamiliar synthesized electronic voices, plus menacing, low-pitched buzzing sounds, high-frequency arpeggios, simulation of a human heart-beat and something suggesting banging on an electronic trash can. The listener’s interest never has a chance to lag into boredom. If Alison Moyet ‘s name isn’t a household term in the U.S. it isn’t for any lack of recognition in the U.K. and the rest of the English-speaking world. In the 80s she co-founded duo Yazoo (“Yaz” in the U.S.) with Depeche Mode’s Vince Clarke. She then she moved to a solo career with the album “Alf” (her punk nickname) that reached number 1 on the U.K. charts. Since then she has put out a number of albums with varying degrees of success. She has collaborated or appeared with Paul McCartney, the Eurythmics, Bob Geldof, Bowie, Sinead O’Connor and Pete Townshend. “Other” contains 10 tracks of a predominantly synthpop style, highly accessible, and obviously the work of an accomplished music professional and veteran with mastery of a variety of vocal techniques. Famed for her impressive contralto, her voice is “bluesy” although the music isn’t Blues by any means. The first track has a trip-hop feel reminiscent of Portishead and affords the artist to showcase her powerful and emotionally evocative tremolo – as do several tracks that follow. Melancholy, but not morose, her vocal style fits equally well with slow-paced grooves as well as mesmerizing, rapidly paced dance tracks. She sounds sweet – like a string instrument – in the fourth track, then goes deep during the funky, explosive fifth track. The seventh track is an engaging, existential spoken word poem layered on a menacing, hissing soundscape. When, on the eighth track she is accompanied by a limited piano, she modulates her singing to the same sparse, exquisite level, but raises her presentation to almost operatic level when reaching for her raw, rock roots on several other tracks. Listeners will find this album with its variety of styles accessible, appealing and quick to grow on them. This is artist knows how to express herself and therefore how to engage and please an audience. 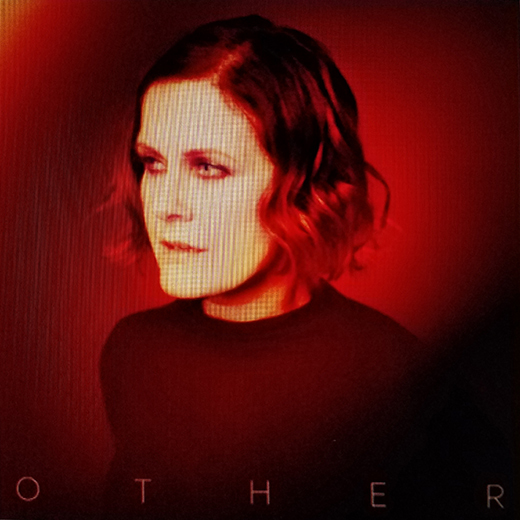 Alison Moyet will tour the USA and Canada later this summer, hitting the Philadelphia/Boston/ New York circuit in early to mid-September.